Instead of lounging by the pool or sleeping in until noon, I worked full-time in the summer during my Junior year of high school. I ran a volunteer program at a rest/nursing facility in my hometown. I’m a natural spender, but I was determined to save my earnings for a sole purpose – I wanted a puppy. I had browsed the internet for hours upon hours trying to find the perfect breed. I was instantly drawn to West Highland White Terriers and as I perused pictures of their fluffy teddy bear faces, I became obsessed with having one of my own. Until I actually obtained the living and breathing version, I decided to pretend and visualize it into existence. I had a Westie monthly calendar pinned on my cork board and a stuffed animal replica on my bed to cuddle with each night. I know. I’m not sure how I had a steady boyfriend either. On a hot and humid July evening, my family and I piled into the car and made our way to Lincolnton where I was finally going to turn fantasy into reality. I watched a litter of white fluffballs carelessly run and topple onto one another. As I picked up the puppy with the softest hair and cutest personality, my heart melted. I was sold. I pulled out a crisp new check, depleted my savings and left the breeder’s house with little Scottie curled up in my arms. We’ve been through a lot together the last eleven years. I couldn’t have picked a better dog. Literally. He’s had some interesting experiences over the past decade like the rat poison scare or the time he escaped captivity to chase deer, but nothing compares to the freakish accident he endured a few weeks ago. My mom was graciously cooking chicken-n-dumplings in the kitchen. As Scottie usually does, he waited patiently by her feet hoping for a drop of one tiny morsel. As mom was transporting the finished product from the crock pot to a serving dish, the handle of the ceramic crock pot unexpectedly broke and the contents spilled onto the floor and ultimately, onto Scottie. We immediately attended to him and gave him a bath to clean up the chicken broth residue. Despite his initial whelp, he seemed fine and everything appeared normal. It wasn’t until a week later when he started misbehaving and acting erratically that I began to wonder if something was wrong. Once we finally examined his body, we noticed his tail was oozing and unless you wanted to lose your fingers, touching it was out of the question. I immediately took him to the vet where they confirmed he had third degree burns on his tail. It was by far the absolute worst vet visit of my life. I hate going to the vet in the first place. It smells. I’m not fond of other dogs because they aren’t as cool as Scottie. There is always fresh pet urine on the floor. They always cut Scottie’s toenail too short. It bleeds. I almost pass out. It’s a miserable experience for both of us. This visit was particularly rough because of the condition of his tail. Since it had started to scab over, in order to heal and to be properly treated, they needed to scrub off the scabs. I could hear my poor puppy wailing from the room next door and there was nothing I could do. I felt horrible. He is such an awesome dog and this freak accident had caused him undeserved immense pain. I imagine that is the closest thing I’ll feel to being a parent and watching a child suffer. But this tale and tail both have a happy ending. Scottie is now the proud of owner of a healthy and wagging tail. He’s back to his normal fast-eating, treat begging, rub-my-belly pleading self. My dad rewarded him (and me) by creating a custom-built bed for Scottie to lounge and relax. The custom bed matches our living room decor and is built on wheels so we can easily move it around. Dad did all of the hard assembly work, and we simply stained the wood a light grey color to match our color scheme. My dad is quite the handy man and is a master carpenter. Probably the best in the world. Just saying. Want a custom bed built for your dog? Just say the word. My dad builds them in all sizes for tiny little yorkies or large mastiffs. They’re Scottie tested and approved. For the past few years, I’ve decorated for Christmas in bright and bold colors. If it had glitter, it belonged in my house. For some nostalgic reason, I decided to revert back to a more traditional Christmas style for this year. I completed an ornament overhaul and went from flashy colors to the recognizable and comforting red and green color scheme. Reflecting a rustic theme, I’ve adorned my tree with ornaments from childhood and a homemade burlap garland. After searching multiple stores, which I never anticipated being so difficult to find, I finally located and purchased a train set that now circles the base of our tree and reminds me of the one my brother and I would assemble each year growing up. When I found this project on Pinterest, I knew I had to give it a try. It immediately made me think of the first time I attempted it, which was in elementary school. Let’s face it, a lot of the projects on Pinterest are from our childhood and what better what to celebrate the holidays than reliving those memories. Creating these cinnamon and applesauce ornaments is such an easy project and provides you with an opportunity to create a new memory and tradition with your children, family or even a friend. In addition to making large ornaments that now hang on my tree, I decided to create smaller ones to use as accessories when wrapping gifts. And even if you’re not a sucker like me for sentimental holiday pieces, the amazing smell of the cinnamon and applesauce in the oven will put a smile on your face and will certainly make your nostrils dance. P.S. – Yay Mom! You’re the first person with a gift under the tree! 2. Using about 1/4 of the dough at a time, roll dough with a rolling pin. Cut dough into desired shapes with cookie cutters. Make a hole at top of ornament with drinking straw or toothpick. Place ornaments on baking sheet. 4. Insert ribbon or twine through holes and tie to hang. It’s okay if after you read this blog post you question my sanity. I usually do on a daily basis so welcome to the club. We can blame this entry on Pinterest for giving me another online addiction to annoy my husband and for encouraging my OCD behavior. I’ve been following and “pinning” home organization ideas onto my little hope-I-someday-get-around-to-it boards for quite some time now. Instead of harboring the ideas and letting them go to waste, I’m actually going to attempt to implement the ones that excite me. I’m embarrassed to admit that executing this simple, no-brainer idea literally did enliven me. Anything to do with organizing and grouping totally gets me giddy inside. I despise clutter and I’ve hated how my cleaning supplies were organized since the day I tucked them beneath the kitchen sink nearly four years ago. There was no rhyme or reason. Some supplies found a home in the cleaning carrier while others were lost orphans stranded within a group of misfits. It was nearly impossible to pull out the bulky container holding the supplies because of the kitchen sink pipes. Anytime I asked Chase to get out the countertop spray, he’d complain because he’d have to bend down to get the spray, which would then lead to him complaining about his bad knees. Complaints about the knees would lead to complaining about hating Halloween which would be followed by complaining about the punks that jumped him on Franklin Street and ruined his chances of ever rushing the NC State football field again. So you see kids, there were certainly more reasons than just appeasing my obsessive behavior for getting my cleaning supplies organized and within an easy reach. I saw the idea of using a shoe organizer for cleaning supplies on Pinterest and literally fell in love. We only have a laundry closet as opposed to an actual laundry room so this idea is perfect for our space and ideal for hanging on one of our pantry doors. I bought the shoe organizer from Target for $8.19. The entire project took a measly five minutes and could have probably taken less if I wouldn’t have spent so much time grouping my cleaners by type (air, counter, bath, floor, etc.) before putting them into the holders. I talked myself out of arranging them alphabetically within their type because I need to hang on to some sort of dignity. I may or may not have opened and shut the pantry door a few times to admire how nice and neat the items looked all snuggled inside their new sleeping bags. That’ll be our little secret. Here’s to hoping Chase The Crumb Monster finds the new set up as exciting as me and quits leaving particles of his freshly prepared breakfast scattered all along the kitchen counter. A girl can dream. My husband has one mission each and every single day – to annoy me. His annoyances are intentional and undeniable. Some days it’s the constant poking and slapping of my junk in the trunk while other days it’s the picking me up and twirling me around as if we’re auditioning for Dancing with the Stars. He also enjoys leaving crumbs scattered on the kitchen countertops and quite frequently requests I remain in the bathroom while he showers, never mind the fact I’m in the middle of preparing dinner. My response usually graduates from a playful smile to a roll of the eyes to a stern “Chase Taylor” warning. I can’t fault him for his efforts. He warned me in his wedding vows that he would strive every day to get on my next-to-last nerve. He knows to stop before getting to the last one. Although his daily attempts to get me flustered are usually successful, this past week he demonstrated behavior so neurotic and absurd that it deserves public recognition. On Tuesday, Chase called me on his way home from work for our routine evening conversation to tell me he had stopped at Sonic to pick up a Route 44-sized Strawberry milkshake. It was odd, to say the least, considering he rarely visits a fast food joint out of impulse. When he walked into the house, his gigantic milkshake was in the form of a beautiful bouquet of flowers – just for me. Those flowers fulfilled my sweet tooth unlike any milkshake could. Saturday morning I woke up to breakfast in bed. I’m not joking. I thought I was still dreaming when he came waltzing through the bedroom with a plate full of eggs, waffles and fresh fruit. I kept looking for a side of reality somewhere on the plate. I was tempted to ask the stranger in the bed next to me when my husband would return home, but I figured it was best to ask for forgiveness than permission. Perhaps the sweetest token of affection bestowed upon me this past week was a gift so thoughtful and meaningful, I will always cherish it. I enjoy wine. Whether I need a relaxer, picker upper or just the need to feel sophisticated, wine does the trick. Two weeks after Chase and I started dating I told him I was going to marry him. I know I broke all the rules. I appeared desperate and certainly wasn’t playing hard-to-get. The words were released from my mouth partly due to the fact that I knew he was the one and also due to the fact that I had consumed a bottle of wine. The night of our engagement, Chase bought a celebratory bottle of wine. Long after the wine was emptied, the bottle remained a staple in our collection of “us” things. You know the little collectibles you hold on to in order to remember a certain place and time. I wanted to save that wine bottle regardless if it was just rolling around the useless cabinet above our microwave. Unknown to me, Chase sent our wine bottle to Christine Masters with Masters Glass Art to have it melted into a gorgeous spoon rest. Not only does it make a decorative accessory for our kitchen counter but it is now a practical memento from the night of our engagement. It was such a unique and unexpected testament to our relationship. So, before you recycle (Please recycle!) your old wine or champagne bottle, consider turning it into a functional keepsake. It’s an inexpensive way to create a priceless heirloom to remember your special occasion or to give as a gift. As for my husband, his shower of sweetness this past week has increased my threshold of tolerance when dealing with his attempts to annoy me. It has also reminded me that our marriage is somewhat like a fine bottle of wine, getting better with time. P.S. – Receiving this beautiful spoon rest has reminded me that I still need to purchase one for my dear friend Aimee since I accidently dropped and shattered hers at our annual “Thanxmas” get-together. Unfortunately I can’t blame it on the wine, I’m just clumsy sometimes. “Candy Bar Buffets” are all the rage at wedding receptions – as they rightfully should be. The bride and groom like the idea because it’s inexpensive and because the candy can be color-coordinated to match the wedding colors. (Ok, so the groom cares about the money and the bride cares about colors.) The guests love “Candy Bar Buffets” because it gives them an opportunity to have an active role in the wedding and because it’s a favor they won’t end up throwing away. Whether they’re stuffing their mouths with personalized M&M’s or piling their doggy bags full of jelly beans, this idea is one sweet treat. 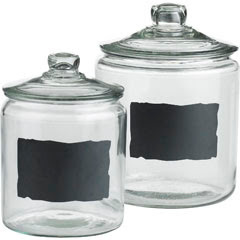 I saw these chalkboard canisters at Pier 1 Imports and thought they would be perfect for a “Candy Bar Buffet.” You can label the canisters accordingly using the chalkboard. The best part is after the wedding, you just simply erase and re-use! They’re cheap but super chic. Pier 1 also has drinking glasses that would be perfect for entertaining at home. It’s definitely a step up from the standard solo cup and sharpie! This past Christmas my best friend and I gave each other the same Christmas card, as did my husband and I. Out of the hundreds of cards filling the shelves in Hallmark, I chose the same card as they did. Sadly, this isn’t the first time an identical card exchange has taken place. Maybe it shows that I’m spiritually connected to those I love, but I find it boring to give and receive the same card. I’m determined this Valentine’s Day to send a card that’s more personable and meaningful. I’m embracing my inner artist and designing my own! The latest issue of Better Homes & Garden has a wonderful article online with lots of examples and step-by-step instructions for creating a one-of-a-kind Valentine’s Day card. 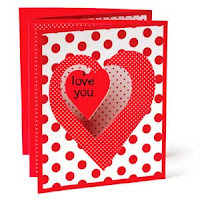 Your Valentine is sure to appreciate the time and effort you put into making an individualized card. Brides – why not carry this idea over into your wedding planning? Design custom cards asking your friends to be bridesmaids or give one-of-a-kind thank you cards to shower attendants. Remember, when you care to send the very best – make it personal!